Tomorrow is race day for me, a C-race but still a race. On the day before a race, I usually go for an easy run to unwind or to a yoga class to get a good stretch. Not today, though. My typical prerace routine went out the window as I took my sons to CIBC PanAm Park. PanAm Park, known as the centre of all of the PanAm action, is a great place to take kids as there is a little bit of everything. 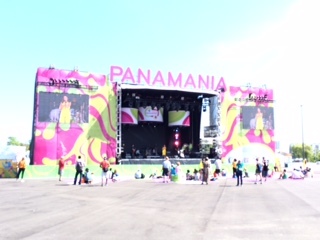 The main stage has several performances each day and we were lucky enough to get there on time to see Eva Avila, who sings Unidos Somo Mas, the official theme song of the PanAm games. About an hour later, Cirque Inspirall wowed their audience with their acrobats. Every day of the games, all day long, there are entertainers lined up and, the best part is, it is free. Powering a slot car with his own energy and being able to see himself on the big screen. What a great idea! Of course, there are also a few sport events. Chevrolet has a large tent set up with an indoor volt-powered slot car track. Each of us had our turn pedalling a bicycle against four other people to see whose car could get to the finish line first. The oldest dude raced and finished first in his group. The Littlest Dude and I went together and he finished ahead of me in first place! 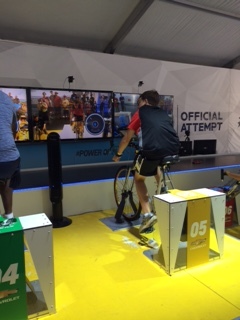 While we were only on the bikes for about a minute, it was a hard minute of spinning and my quads were burning by the end. All I could think about after was whether I would regret that minute of spinning at tomorrow’s race. There was lots more to do at PanAm Park. Some people played wheelchair basketball; others tried their hand at Bingo or throwing darts. 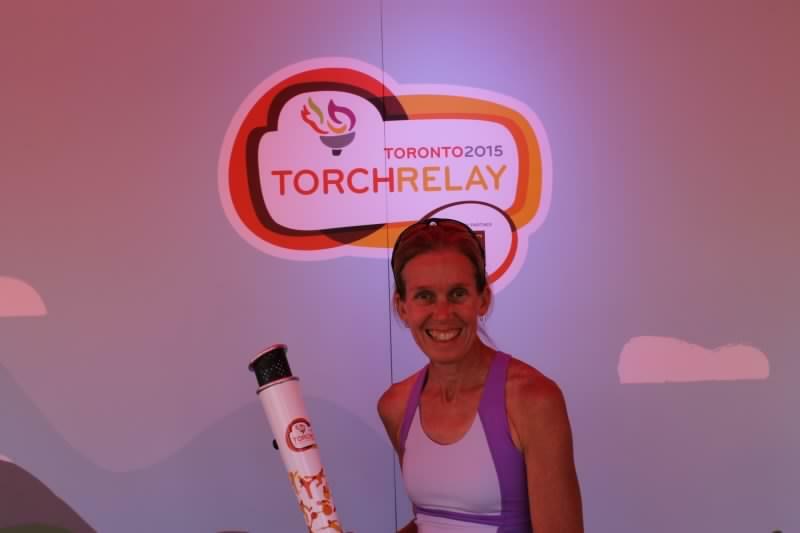 The three of us walked around PanAm Park and were able to have our pictures taken holding a PanAm Torch or next to an image of the CN Tower. The Littlest Dude had his picture taken in front of a green screen, and his head was superimposed on an ultrasound image of the human body. We could hold a bronze, silver and gold medal from the PanAm Games and, if we waited long enough in the Coca-Cola line, we could each have had our name printed on an empty coke can. We were only at PanAm Park for a few hours since we had to get back home so that my oldest could get to work on time. However, we could have easily spent a few more there. The atmosphere was fantastic. If you haven’t been yet, you’re missing out on a lot of fun.